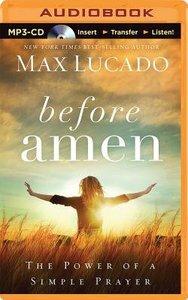 In Before Amen bestselling author Max Lucado joins listeners on a journey to the very heart of biblical prayer, offering hope for doubts and confidence even for prayer wimps. Distilling prayers in the Bible down to one pocket-sized prayer, Max reminds listeners that prayer is not a privilege for the pious nor the art of a chosen few. Prayer is simply a heartfelt conversation between God and his child. Let the conversation begin. About "Before Amen (Unabridged, Mp3)"